You know every night those nights when you just do NOT feel like making dinner and you are tempted to get out the cold cereal and frozen waffles? Well, this dinner takes a whole 5 minutes of prep and is done in 30 minutes total. I didn’t even use a separate bowl to mix the ingredients, just threw everything into the casserole, stirred and stuck in the oven. My family ate this, loved it and even finished the leftovers. 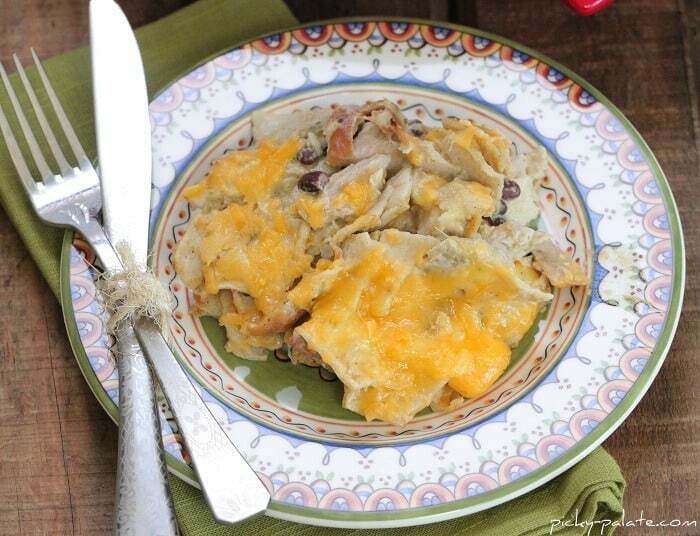 Think green chili chicken enchiladas, but waaaaay simpler. No fuss at all. For someone who didn’t feel like making dinner, you sure made a beauty and such gorgeous photos…that I’m guessing were not taken at 630pm with dinner hour lighting 🙂 Otherwise, I need to use the lights you’re using! And that plate is gorgeous! We actually eat dinner about 4:30 and yes this was an actual night I wasn’t planning on taking photos. Guess I got lucky. 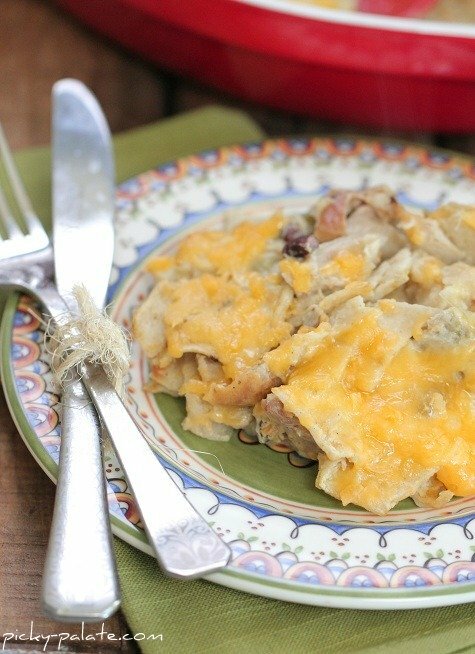 My Mom used to make a version of this growing up…we called it King Ranch Chicken. It was always so filling and is total comfort food! I love meals like this where you just throw it all in a pot. My go to is pasta so it’s good to have an alternative! Not much more prep time then you listed, but ready to go from the crock pot is awesome! Sandy I am about to make Jennys recipe for dinner. Would you mind sending me your recipe as well. I need something to make that will keep heated for a crowd. Thank you! ah yes, i need more of these dinners in my life. after working all day there’s just something about making dinner that – even if i don’t want to do it – feels good when you’re sitting down to a great meal! This would be perfect after a hard workout because man there are just some nights I can’t get jazzed to make dinner when I can barely lift my arms! Fabulous meal idea for those busy weeknights families have so often. Meal Planning can help on so many levels. One very important thing to keep in mind with every Meal Plan you create, is to be realistic about your time. Great recipe! Do I see black beans in there? If so, did you use the whole can? I did the same thing last night only a beef version. Lean ground beef, rotel tomatoes, sharp cheddar and basically the same things you used for the rest of the dish. Either way, it’s a winner! Done and done and done times a billion. Hey, I make something similar, except I use corn instead of beans and Monterey Jack in place of the cheddar. Either way, super simple especially when made with store bought rotisserie chicken. Love this go-to meal. this looks so tasty and maybe my kids will eat it!! They are very suspicious of anything new lately! This looks so good and easy. You made enchiladas a whole lot easier. I love Mexican food. Great job! I totally don’t feel like making dinner tonight. 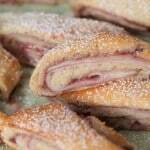 I think I’m going to scour my pantry to see if I have everything for this, yum! 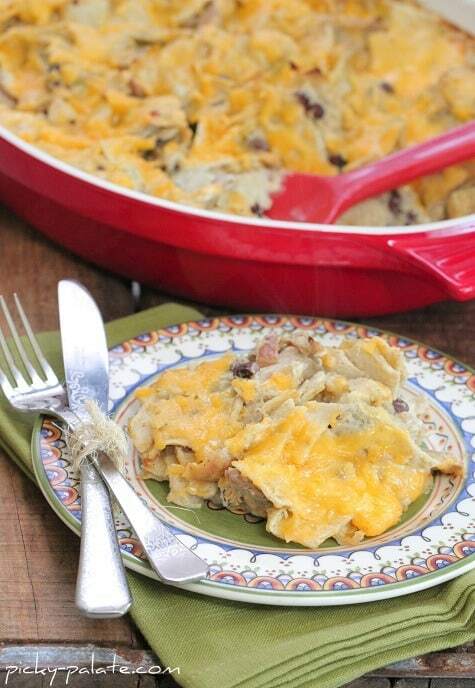 This casserole looks fab but I really want to know where you got the gorgeous dishes! This sounds amazingly good and easy. Can’t wait to try it. I made this tonight and it was delicious! We spiced it up a little by adding a small can of chopped jalapenos(drained). I loved tearing up the tortillas-I think it tasted exactly the same as when you roll them all up! So needless to say, I’ll be doing it your way in the future!! 🙂 Thanks! I like it. It’s always good have some of these in your back pocket on those nights when the frozen waffles and cereal are beckoning. Made this last night and it was delicious! You have some amazing recipes! Keep them coming!!!! Ilove how this goes together so fast and with minimal fuss! I am going to have to keep this recipe handy for one of those crazy busy nights when I don’t feel like making dinner or just don’t have the time to make the usual dinner. Yum! I made this last night. It was SUPER yummy, my boys and hubby loved it. I added some corn for crunch and use medium salsa for a little spice. Thanks so much, I will for sure be making this again! Just made this tonight, with green taco sauce instead since I couldn’t find the right kind of enchilada sauce. So good, thank you! Posting to my blog tomorrow. This is just what the Dr. ordered for tonight’s meal! Thanks for sharing! Due date must be just around the corner — hope you are feeling well! So glad to hear it Donna! Thanks for sharing. 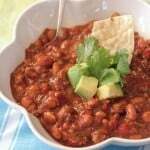 I was wondering if refried beans would work in this recipe? 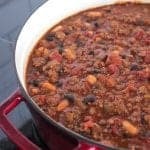 If so do you think it would be good with both refried beans and black? Also when would you add the refried beans do you think? Thanks for your help! Hi Jenny! I am wondering if making this the morning before baking would be any issue? I wanted to make this early so I could just pop it in the oven when I got home from work. My only thought was that the tortillas might become too soggy or breakdown, but maybe that’s okay. Can’t wait to try this one – it looks fantastic! Thanks for your help in advance!